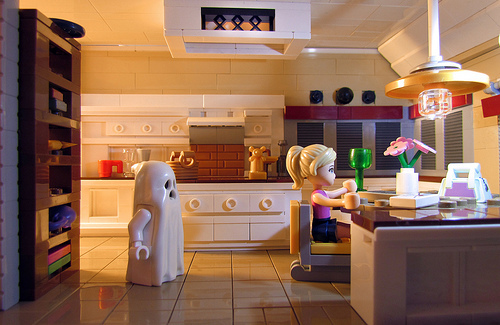 Millie McKenzie, better known to most viewers as Leda Kat, takes one of the best moments from the otherwise forgettable 2011 film Paranormal Activity 3 and translates it into an eye-catching LEGO diorama. I realize this model doesn’t exactly qualify as new (it was posted 12-5-12), but I just recently discovered it and I’m willing to gamble that many of you missed it too. Leda has a large catalog of great models, so be sure and click through her photostream if you have the time. Plus, it has a ceiling. Great work Mills.